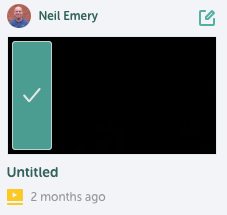 When content is added to TrilbyTV, by default it is unapproved and not visible to everyone except moderators and the user who uploaded. Content awaiting approval will have a green tick displayed on top of the preview image in the content feed. As a moderator, you can simply tap the tick to approve, or you can tap the Edit icon to view the content and the settings applied to it. In the Edit view, you can side the Approve Content switch to green which has the same effect as tapping the tick.